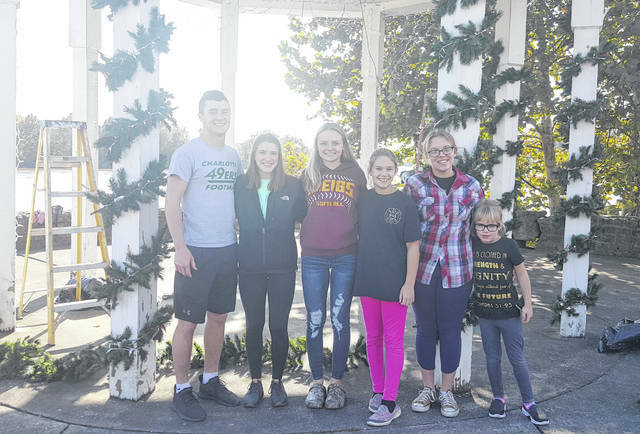 A group of volunteers organized by George and Nelle Wright worked to decorate the gazebo on the parking lot Tuesday afternoon. Pictured are (from left) Zach Bartrum, Lydia Edwards, Shalynn Mitchell, Phoebe Rife, Halo Rife and Olivia Rife. Zach Bartrum and Lydia Edwards work to hang the greenery on the gazebo. POMEROY — It may be Halloween, but in downtown Pomeroy it’s beginning to look a lot like Christmas. Shops in the downtown area have been busy preparing for the annual Christmas Open House shopping day which will take place on Monday, Nov. 5. Greenery and lights were placed on the gazebo by a group of volunteers, while village workers placed decorations on the light posts. The open house event serves as the kick-off to the Christmas shopping season each year in the village. “This is a preview event, a way for people to begin their Christmas shopping and do so locally,” said Paige Cleek, owner of Front Paige Outfitters. Shops like Weaving Stitches, Hartwell House, Front Paige Outfitters, Clark’s Jewelry and Divine Notions, will have extended hours on Nov. 5, some open from 9 a.m. to 9 p.m., with others open from 10 a.m. to 9 p.m.
“It’s such a wonderful event,” said Susan Clark, owner of Clark’s Jewelry. “Everybody has all of their new Christmas items, the stores are decorated; it is the perfect time to shop local and visit our beautiful downtown,” added Clark. From lunch or dinner at Court Street Grill to all the shopping along the way, it will be a festive day in town. “We would like everyone to come out and be a part of our beautiful downtown and our Christmas kick-off event,” said Clark. There will be giveaways, special promotions and refreshments throughout the day at the various shops. “This is one ways the merchants can give back to our customers, who give us so much support throughout the year, as we approach the Christmas season,” added Clark. In addition to the Open House event on Monday, many of the Pomeroy Merchants will be participating in Small Business Saturday on Nov. 24 and hold special shopping hours following the Christmas Parade on Nov. 25. For additional details on the Open House shopping event at the local merchants see their ads inside the print editions of The Daily Sentinel this week, as well as the Saturday Point Pleasant Register and the Sunday Times-Sentinel. https://www.mydailysentinel.com/wp-content/uploads/sites/14/2018/10/web1_10.31-Christmas-1_ne20181030145122718.jpgA group of volunteers organized by George and Nelle Wright worked to decorate the gazebo on the parking lot Tuesday afternoon. Pictured are (from left) Zach Bartrum, Lydia Edwards, Shalynn Mitchell, Phoebe Rife, Halo Rife and Olivia Rife. 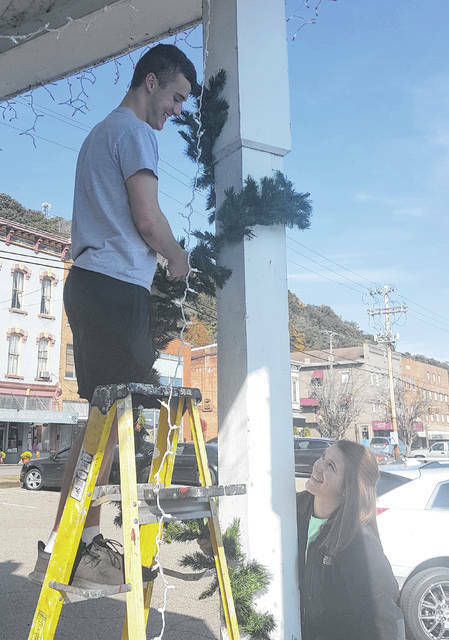 https://www.mydailysentinel.com/wp-content/uploads/sites/14/2018/10/web1_10.31-Christmas-2_ne20181030145127131.jpgZach Bartrum and Lydia Edwards work to hang the greenery on the gazebo.